“You’ve got your hands full,” the mechanic at the auto service center told me as I was paying for my oil change. “Yes I do,” I responded, as my boys poked each other, giggled and ran around the small office. To be fair, we had been waiting for a while in a small space, and it was almost lunchtime. They were actually pretty well behaved. No screaming or anything. They just got antsy at the end. Disciplining children can be a challenge. And boys certainly can be a handful. 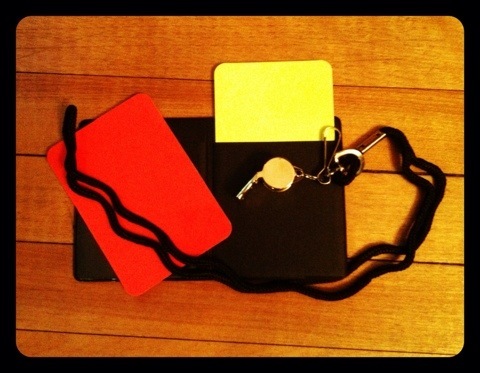 My husband and I joked that we needed those yellow and red cards that soccer (or football, to be proper) referees use during matches. And then I found this Soccer Referee Kit (affiliate link). My new creative discipline / referee kit. I ordered it immediately. Heck, it was only $4. What started as a joke became a fun way to discipline the boys. Because, let’s face it, little boys get loud. Sometimes, you need a whistle to get their attention. They know to stop what they are doing when they hear the whistle. If they get a yellow card, that’s a warning. Another yellow card means a time out. A red card means that the recipient of the card needs to go to their room to cool down a bit. As Mom, I have the right to go straight to the red card, if I determine an infraction is bad enough to warrant a trip straight to their rooms. So far, the technique has worked. While they laughed the first time and tried to turn the tables and give me a yellow card, they realized quickly that it was Mom’s kit and not theirs. At least I get their attention. And that’s really all I want to do. How about you? What kind of creative discipline tools have you used to get your children’s attention? We thought about the yellow football flags, but we decided against it because you have to throw them. That would just invite more mayhem! Didn’t think about the red challenge flag. Too funny!